The countdown is on to one of the premier competitions in the world of polo, the XI Federation of International Polo World Polo Championship in Sydney, Australia. The championship celebrates its 30th anniversary during this year's event, which runs October 21-29 at Sydney Polo Club. It will be broadcast on Eurosport, which reaches 151 million homes in 54 countries and in 20 languages, on November 6. The USA Team is considered a favorite in Sydney and will first compete for the championship against power house Argentina, as well as Australia, Chile, England, Spain, India and New Zealand. In 2015, Team Captain Felipe Viana led the USA Team to the finals of the X FIP World Polo Championship, where they lost by one goal to Chile in overtime. The USA Team last won the championship in 1989, taking home the perpetual trophy, which was donated by the late Maharaja Sawai Bhawani Singh for the first FIP Polo World Polo Championship that took place in Buenos Aires, Argentina in 1987. The historic trophy has travelled all over the world and will be on display at the Sydney Polo Club ready to be claimed by the championship team. The United States Polo Association®, the national governing body, and the U.S. Polo Assn. brand will be in Sydney to support the USA Team players Jimmy Wright, Jesse Bray, Felipe Viana, Matias Gonzales, Daniel "Cacho" Galindo and Carlucho Arellano as they compete for this year's title. "We have worked hard and pushed ourselves to get to this point," Viana said. "It's exciting to have that hard work pay off and enable us to compete at this level among the best players in the world." This year's nine-day event provides a well-rounded offering of activities to appeal to families and people of all ages and will include an adult and kids U.S. Polo Assn. fashion show, live music daily at various locations in the International Village, an art exhibition and children's activities. A favorite activity is the Divot Stomp at halftime. Spectators are invited onto the field to replace the divots that have been kicked up by ponies' hooves. The FIP World Polo Championship is held every three years. It is a competitive tournament held at the 10-to-14 goal level, with each player to be handicapped between 2 and 5 goals. Horses are provided by the host and pooled among participating nations to give teams equal playing conditions. U.S. Polo Assn., the official apparel supplier, will be prominently represented throughout the event, outfitting all eight teams with official team jerseys, equipment bags, hats and vests. 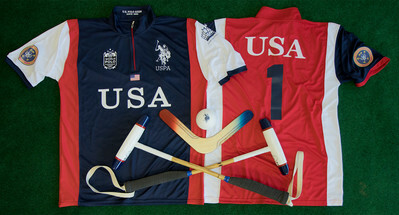 The USA Team is one of eight teams that qualified for the competition and will be outfitted with exclusive team blazers and off-field casual apparel. "We are proud to participate as an official sponsor of the FIP World Polo Championship in Australia," USPA Global Licensing President/CEO, David Cummings said. "Our brand honors the polo tradition and directly supports the sport's initiatives. We're thrilled to spread that message to a new audience as we root for the USA Team to take home the World Cup."